As you know I love my job and can’t imagine ever doing anything else. It can be a little overwhelming at times with peaks and troughs of work, ever growing ‘to do’ lists and jobs that slot in the diary at the last minute but I wouldn’t swap it for the world. I love researching latest thinking and creating materials to help my clients achieve amazing outcomes. And of course, I love the actual time I spend with each and every client as there’s always some two way learning. When we start a new year we often take the opportunity to review what went well during the last year and what we could do to make it even better in the next 12 months. I carried out a similar exercise over the Christmas period and I thought I’d share it with you as it linked into what I’d written about in my last newsletter. You may remember that I’d already started some work identifying where I was hampering some of my achievement. I decided to explore this work further and use my time off to explore where I’d allowed my lack of action and busyness to impede my results personally and professionally. 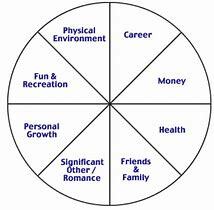 I decided to use a well-known model in the coaching world called The Wheel of Life. I love it because it’s so visual and easy to use, like a lot of my tools and techniques! Having finished my alphabet newsletter last month I’ve now decided to link into the ‘awareness’ months that happen throughout the year! 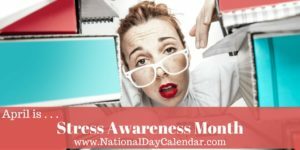 April is ‘Stress Awareness’ month so I thought I’d share some tools and techniques that I find useful to combat some of my stressors and hope you will find them helpful too.